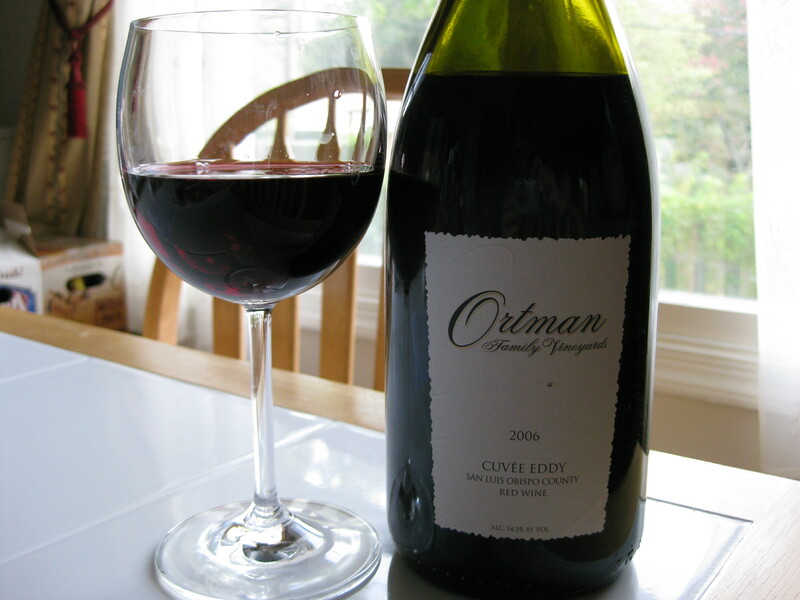 I picked the Ortman Family Vineyards 2006 Cuvee Eddy as the wine for the evening. I purchased this bottle from Domaine547. It now costs $16.99, originally $21.99, though I can’t remember what I paid for it. I bought it in one of my searches for interesting new wines that Jill helped me with. It clocked in at 14.3% alcohol by volume, hails from San Luis Obispo, and had a real cork closure. 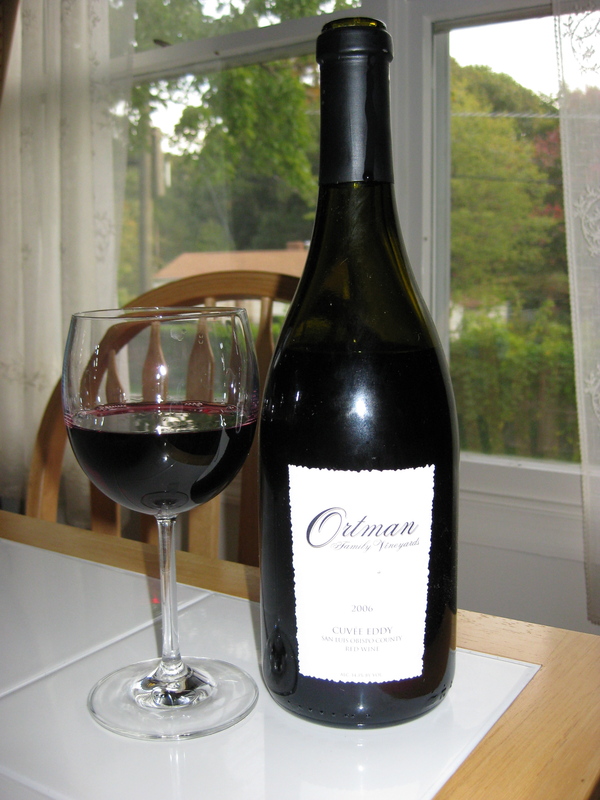 The blend is 44% Syrah, 30% Grenache, 15% Petite Sirah, 9% Mourvedre, and 2% Viognier. Right there you have 5 of my all time favorite grapes blended into one wine…how can you go wrong? I set the wine for the evening on our coffee table, mainly because I have coasters there, and it requires Matt to get up and pour me wine, rather than the other way around. The first thing I notices about the wine is that I can smell it from 3+ feet away before I’ve even got a glass of it in front me me. On the nose I found berries, lots of berries. Blackberries, blueberries, black cherry, spice, pepper, earth, baking spice, and cinnamon all wafted our of my glass. In the mouth, big tart berries, blackberries, earth, red currants, chocolate, vanilla, pepper, and spicy wood dominated. More red cherry and red fruit showed in the mouth than I would have expected from the nose. My thought in drinking this wine turned to bbq….I think it would stand up excellently to spicy bbq sauce. The wine had tannins to spare and a firm structure. Ready to drink now, or should keep for a few more years if you wish. Yum!